Outpatient primary care experience is vital to internal medicine resident training but may impact quality and equity of care delivered in practices that include resident physicians. Understanding whether quality differences exist among resident and staff primary care physicians (PCPs) may present an opportunity to address health disparities within academic medical centers. To determine whether there are differences in the quality of primary care provided by resident PCPs compared to staff PCPs. A retrospective cohort study with a propensity-matched analysis. 143,274 patients, including 10,870 patients managed by resident PCPs, seen in 16 primary care practices affiliated with an academic medical center. 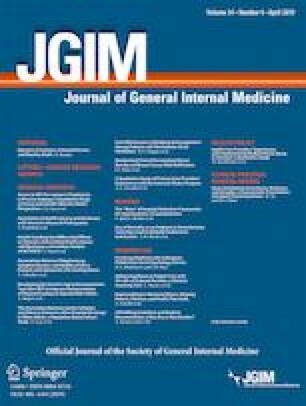 Guideline-concordant chronic disease management of diabetes (HbA1c, LDL) and coronary artery disease (LDL), preventive breast, cervical, and colorectal cancer screening, and resource utilization measures including emergency department (ED) visits, hospitalizations, high-cost imaging, and patient-reported health experience. At baseline, there were significant differences in sociodemographic and clinical characteristics between resident and staff physician patients. Resident patients were less likely to achieve chronic disease and preventive cancer screening outcome measures including LDL at goal (adjusted OR [aOR] 0.77 [95% CI 0.65, 0.92]) for patients with coronary artery disease; HbA1c at goal (aOR 0.73 [95% CI 0.62, 0.85]) for patients with diabetes; breast (aOR 0.56 [95% CI 0.49, 0.63]), cervical (aOR 0.66 [95% CI 0.60, 0.74]), and colorectal (aOR 0.72 [95% CI 0.65, 0.79] cancer screening. Additionally, resident patients had higher rates of ED visits and hospitalizations but lower rates of high-cost imaging. Resident patients reported lower rates of satisfaction with certain access to care and communication measures. Similar outcomes were noted in propensity-matched sensitivity analyses. After controlling for differences in sociodemographic and clinical factors, resident patients were less likely to achieve chronic disease and preventive cancer screening outcomes compared to staff patients. Further efforts to address ambulatory trainee education and primary care quality along with novel approaches to the management of the disproportionately disadvantaged resident patient panels are needed. The online version of this article ( https://doi.org/10.1007/s11606-019-04960-5) contains supplementary material, which is available to authorized users. The authors would like to thank Ethan Lennox, MA, for his assistance in the preparation of this manuscript. Utibe R. Essien’s role in the research reported in this publication was supported by the National Research Service award grant T32 HP10251. The Institutional Review Board at Partners Healthcare approved this study. A version of the study was presented as a poster at the Society of General Internal Medicine Annual Meeting on April 21, 2017. American College of Physicians. Internal medicine residency programs continue to grow but policies needed to ensure patient access to general internists. https://www.acponline.org/acp-newsroom/internal-medicine-residency-programs-continue-to-grow-but-policies-needed-to-ensure-patient-access. Published 2018. Accessed January 27, 2019. National Resident Matching Program. Thousands of Resident Physician Applicants Celebrate NRMP Match Results. http://www.nrmp.org/press-release-thousands-resident-physician-applicants-celebrate-nrmp-match-results/. Published 2018. Accessed January 27, 2019. Centers for Disease Control and Prevention (CDC). Ambulatory Care Use and Physician office visits. https://www.cdc.gov/nchs/fastats/physician-visits.htm. Published 2017. Accessed January 27, 2019. National Committee for Quality Assurance. HEDIS Measures and Technical Resources. https://www.ncqa.org/hedis/measures/. Published 2018. Accessed November 16, 2018. Stone NJ, Jennifer Robinson C, Chair Alice Lichtenstein VH, et al. Stone NJ, et al. 2013 ACC/AHA Blood Cholesterol Guideline 2013 ACC/AHA Guideline on the Treatment of Blood Cholesterol to Reduce Atherosclerotic Cardiovascular Risk in Adults EXPERT PANEL MEMBERS ACC/AHA TASK FORCE MEMBERS Subcommittee on Prevention Guidelines. http://circ.ahajournals.org/content/circulationaha/early/2013/11/11/01.cir.0000437738.63853.7a.full.pdf. Accessed January 27, 2019. Recommendations for Primary Care Practice - US Preventive Services Task Force. https://www.uspreventiveservicestaskforce.org/Page/Name/recommendations. Accessed January 27, 2019. PPC-Patient-Centered Medical. National Committee for Quality Assurance Website. http://www.ncqa.org/. Accessed January 27, 2019. Fernald DH, Deaner N, O’Neill C, Jortberg BT, degruy FV, Dickinson WP. Overcoming early barriers to PCMH practice improvement in family medicine residencies. Fam Med. 43(7):503–509. http://www.ncbi.nlm.nih.gov/pubmed/21761382. Accessed January 27, 2019.